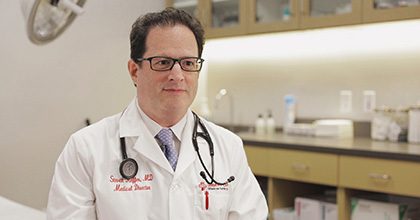 Dr. Steven Heffer saw the need for an urgent care center in his community. He had 20 years of experience in emergency medicine—but none as an entrepreneur. And financing a freestanding hospital required a substantial investment. For a year, Dr. Heffer tried without success to move his vision forward. The banks just weren’t responsive. All that changed the moment he walked into Webster Bank. First, Webster saw a sound business plan, meeting a serious market need. Just as important, Webster saw Dr. Heffer as the right person to lead the enterprise. He brought the skills, the understanding of the local marketplace, and the passion to succeed. Today, just four years after opening the first AFC Urgent Care Center, Dr. Heffer has opened his fourth location.